In the morning I need to get up early. Beth and I are headed to Freeport, ME so she can attend Music Clinic. Va and the boys will stay home. The forecast for Friday is calling for 9″ of snow at my house, and 6″ in Freeport. 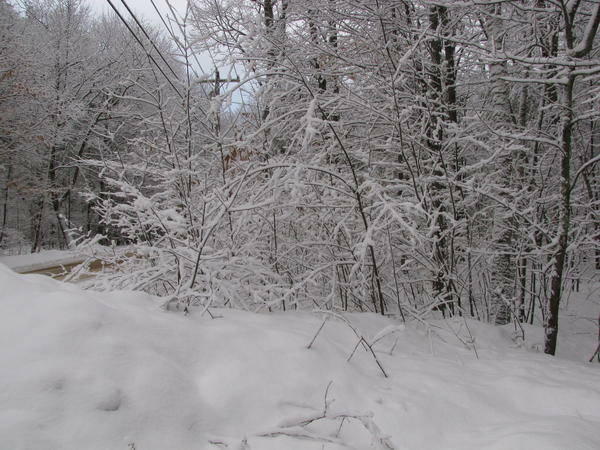 I still have 18″ in my yard in most places (though it’s bare over the septic tank). I’m thinking maybe we should bring our snowshoes. Jonathan will have to clear the driveway Friday evening, but he’s more than capable of that, so there are no worries there. It’s supposed to be a wet, heavy snow, and they are expecting power outages. I’m sure they can deal with that too. I strung David’s broken guitar tonight. Then I tuned it, all the while watching the epoxy joint. It held up just fine! Unfortunately, I can still see where the crack is, so it’s not a perfect repair job. But it is fully functional now. I expect the repair job could be perfected if I were willing to sand down the affected area and refinish it, but I’m pretty sure that with my finishing skills (or lack thereof), that would make it look worse rather than better. It would benefit from a bit of steel wool though, because I did manage to get plenty of epoxy on the outside of the joint. I rubbed most of that off yesterday while it was still somewhat resinous, but since I didn’t get it all off, the finish is still a little dull. Still, you’d have to know that it had been broken to notice any of this, and in my book, that’s a successful repair. The crack is just below the nut on the left. Today David picked up his guitar to get a little practice in and found that it was way out of tune. He sat down to tune it up, but was having a pretty difficult time of it. That’s when he noticed that the guitar’s neck was broken just above the nut near the tuning pegs. I think that’s called the head, but I do not remember the proper terminology for sure. The break was such that the more he tightened the strings, the wider the crack would open. The crack was a quarter inch wide when he noticed. Ouch. I unstrung the guitar and decided that some epoxy and some judicious clamping would most likely be able to effect a repair. I have about a gallon of marine epoxy in the basement. I discovered this stuff when I built my canoe back in 1998. That took all of two gallons. I bought another gallon for general woodworking and for making repairs on the canoe. This epoxy comes with measuring pumps. A single stroke from the resin pump outputs 5 times as much as a single stroke from the hardener pump. However, these pumps no longer operate correctly. I would most definitely want to replace the pumps before undertaking a project that needed more than a tablespoon of epoxy. Hardly any comes out from the resin pump at all – just a drop or two at a time. I went upstairs and found a medicine cup – the little plastic ones that come with children’s liquid meds. I pumped the resin about a hundred times until I had 12.5ml. Then one stroke of the hardener topped it off to 15ml, giving me the required 5:1 ratio. I opened the crack and applied the epoxy to the bare wood with a small artist’s paintbrush. Then I wrapped it with wax paper and got a couple of pieces of wood to place against the head to shield the guitar from the C-clamp. 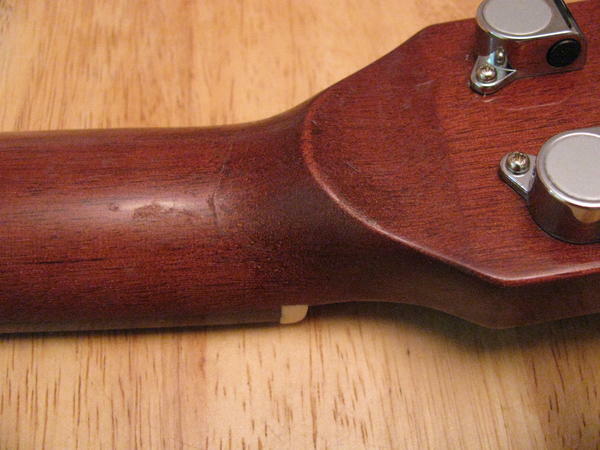 The wax paper was there to prevent those pieces of wood from getting glued to the guitar. After all, an epoxy joint is normally forever. I wiped away as much excess epoxy as I could, but I’m sure there’s a lot more on there where I can’t reach. Tomorrow I will take it out of the clamp and clean it up as best I can. I think I will let it cure for an additional day before restringing it again. I should have taken a photo before gluing it up. Oh well. Two days ago we got about four inches of snow. I thought it was beautiful, but a lot of people in these parts grumbled about it. We had more snow today, but no accumulation. It was coming down fluriously around lunchtime. I met Jonathan at the Tea Garden, which is our habit on Thursdays. 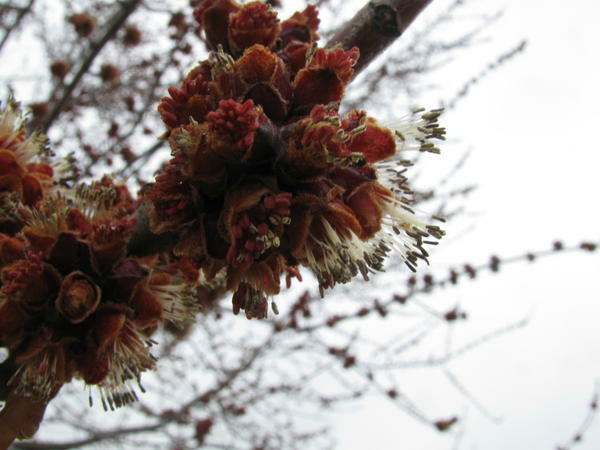 Along the way I passed a silver maple (Acer saccharinum) and from a distance I could tell that it was in bloom. When I got close, I verified. It is the first blossom I’ve seen this year. It beat the crocus and the hyacinths, and I was glad to see it, even if it does mean I won’t be getting much more in the way of snow this year. I still have six inches of snowpack at my place. There are, however, a few bare spots in the woods here and there. It’s hard to tell if that’s enough to justify snowshoes, or if I’m just putting them on for fun. 🙂 But I did put them on today, and found two or three quarts of sap in my maple bucket. I emptied it into my six gallon jug, and noted that it’s pretty close to half full now. I might have to start boiling it down soon. I don’t have a “real” evaporator – that’s hardly justified for only three gallons of sap, especially since they ask four digits for those on Craigslist. I don’t know why! Instead, I will just use a big soup pot. It worked last time. 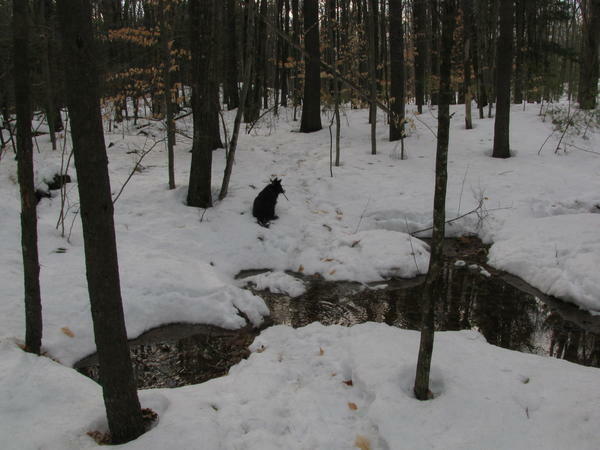 The vernal pools in my woods are growing larger. It’s getting difficult to navigate back there because there are so many of them. The snow is still a foot deep, except where these pools form. There are many of them covering my trail now, so I do a lot of meandering as I go through. Penny is clearly a more mature dog now (she turns four next month), because she also chooses to go around them, even when chasing sticks. Last year she would plow headlong into the water, but not so this year. The photo above shows a couple species. The one sporting a red berry is partridge berry (Mitchella repens) which has shown up in this blog on many occasions in the past. But off the the right side I see the leathery leaf of a trailing arbutus (Epigaea repens). These will be among the first plant to flower, and I do look forward to seeing them in bloom again. One thing I know about them this year, that I did not know last year, it that the blossoms are edible. No preparation required – just pop them in your mouth. I will try that as soon as I see some, and will report on my impressions when I have some impressions to report! I liked this photo because of the way the snow was sparkling. 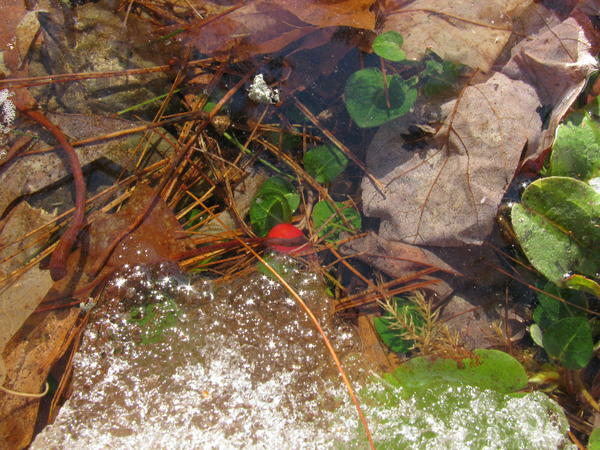 The partridge berry is growing under the water as I have observed them doing in previous years. It seems to not bother them at all. I still haven’t seen any amphibians, but I have not stopped looking yet either. NH Fish and Game has a new site for reporting amphibian (and insect, and reptile, and mammal, and bird) sightings. I’m looking forward to doing that as well. Today I bought a domain name for myself, along with setting up a new personal email address: jomegat at jomegat dot com. Some changes were made at work that will soon make it somewhat inconvenient for me to check my email unless I’m in the office. To avoid this inconvenience, I laid out $17 for a domain name and an email hosting service. I am now in the process of changing my subscriptions to point to the new email address. That’s pretty inconvenient too, but I find it more palatable than the alternative. There were several free options from which to choose as well, but I prefer to spend $17 to do it this way. I could have switched over to my gmail account, but I really am not comfortable with Google mining my email so they know what ads to serve me. I could have switched over to my Yahoo account, but I trust them even less. I also didn’t want a free email service that would attach ads to all my outgoing messages, or display them when I read my own mail. I do not like web-based email clients either, as I have never found one I like better than good old Thunderbird. I could also have activated one of the email addresses my home ISP offers, but I didn’t want to be tied to them with yet another cord. If I ever want to switch ISP’s, I don’t want keeping my email address to be a consideration. (But of course, Va’s account is already tied to them, so it is already a consideration). So now things will pretty much work for me the way they have for the past decade plus, except that I won’t get work emails during the evenings, weekends, vacations, and holidays, and I’m out a couple of bucks per month. Also, I have an email address that should follow me around for the rest of my life. I will still receive email at my old address, but I will only check it during business hours. So if I’m in your address book, you might want to update it. And if I’m not, I don’t mind if you add it. Today after work (hooray Daylight Savings Time!) I slipped into my snowshoes and went out to check my sap bucket again. The last time I looked (Friday?) there was only about a quart of sap in the bucket. Today there were six quarts! I went into the house and grabbed a six gallon jug that I keep filled with water in case we lose power (good for drinking, and for flushing). I poured out the water and then poured the sap into the jug. Then I set it down in a snowbank next to the house. When the snow is gone, I will move it to the freezer in the basement, and when I quit getting sap, or the sap starts to come out yellow, or I start catching moths in my bucket, the season is over. That’s when I’ll get my sap out of the freezer and boil it down into syrup. It takes 30-40 gallons of sap to make a gallon of syrup. All I’m hoping for is a quart of syrup, but I would settle for a pint. 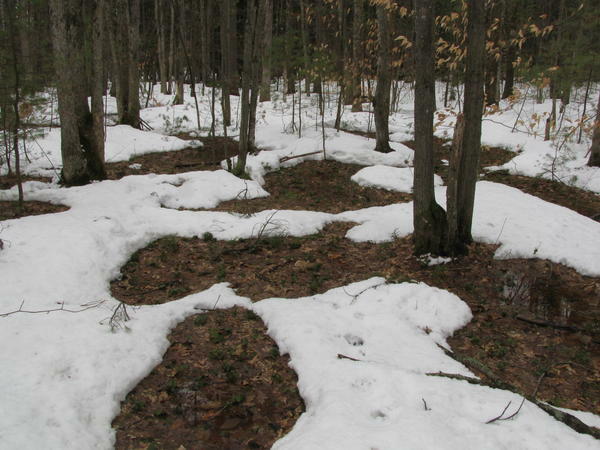 I’ve got huge pockets of melted snow in the woods now, and these pockets form vernal pools. I still haven’t seen any salamanders in these pools, but my understanding is that this is the time of year when they breed, and their preferred venue for that is vernal pools. The other things these pools do besides provide rendezvous points for romantic newts is tell me a little bit about my woods that I did not know. It was once a pasture. I bought a book a while back – Forest Forensics: A Field Guide to Reading the Forested Landscape by Tom Wessels. When I ordered it, I thought it would cover things like animal tracking. I was wrong, but I was not disappointed! Instead, it tells how to tell what the woods had been used for over the past couple hundred years. My forest has a stone wall in it which indicates that it was used agriculturally at one time. But the vernal pools tell me that it was never used for crops. Also it was never used for growing hay. That leaves pastures. These pools form in depressions called “cradles”, and next to each cradle is a mound of earth called a “pillow”. The pillows and cradles are formed when a tree topples over and raises a huge rootwad and excavating the cradle. As the tree decays, the soil in its roots falls to the ground forming the pillow. Forests that have never been used agriculturally will also have pillows and cradles, but they won’t have stone walls. Actually, it’s possible that the land on the other side of my stone wall was used for ag, but not my side. I’ll have to wait for the snow to go before I can really tell. When land was first cleared, the farmers would pile the rocks up and then use them to build stone walls. As fields were plowed annually, they turned up small rocks. These rocks were added to the walls. If the field was used for growing hay, it would not have been plowed except once – and the pillows and cradles would have been severely attenuated, but not obliterated as annual plowing would. Also, they would not have churned up so many small rocks. They plowed hay fields so that they could work them with a scythe – it’s hard to get hay out of a cradle with a pillow in the way. They plowed them only once because that was good enough. I found all this stuff rather fascinating, and plan to fully investigate my woods this spring. It’s fun doing this kind of detective work!